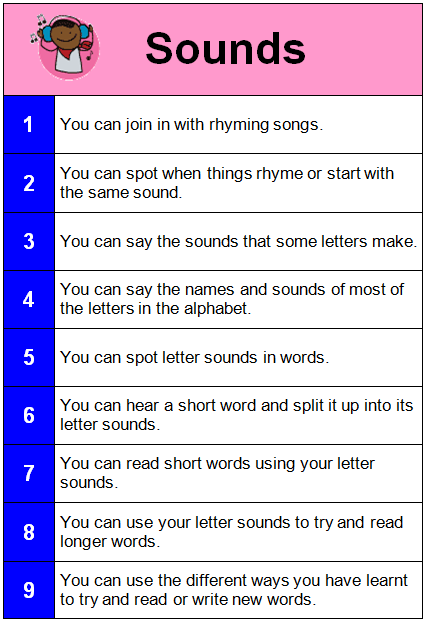 You can join in with rhyming songs. You can spot when things rhyme or start with the same sound. You can say the sounds that some letters make. You can say the names and sounds of most of the letters in the alphabet. You can spot letter sounds in words. You can hear a short word and split it up into its letter sounds. You can read short words using your letter sounds. You can use your letter sounds to try and read longer words. You can use the different ways you have learnt to try and read or write new words.